Sitting back and imagining the life of a Hollywood movie star usually involves dreams of great wealth, enormous castle like homes, fast, luxurious cars and exotic jet-setting trips around the world. These fantasies are based on a life that is overflowing with luxuries, in other words, a life lived by a vast majority of stars. Most people enjoy living vicariously through these stars, after all, who wouldn't want to own everything their heart desires? There are a few exceptions though, that special breed of stars who, through philanthropy and everyday generosity, has shown that they are not concerned about attaining a great deal of wealth. These actors have been shown to use their wealth and position to help others. Whether it be through a charity or through random acts of generosity and kindness, the way in which actors treat those around them is more telling about his or her real worth, than any onscreen performance or bank account can hope to divulge. Being a adept portrayer of a fictional person, in no way relates to being a good person in “normal,” everyday life. There are a ton of great actors who are more concerned with selfish needs, those who are not driven by money, but who are driven by their passion for the art and not the bottom line, these actors are definitely worth uncovering. Of those who follow this more humble approach to their craft, there is one who stands head and shoulders above the others. Keanu Reeves has been in some of the largest box-office successes. His acting prowess and his intellect have often been brought into question, this based solely on the fact that some of his on-screen characters have been less than geniuses and because of his slower than normal form of speech, judgments have been made. He has become a polarizing figure with critics who have dismissed his talent and dubbed him, just another pretty face. These opinions have often been altered, when these same critics have looked more carefully at the career and lifestyle that this particular actor has chosen. When you look at the diverse nature of the movies he has participated in, you realize that he is an actor who is not afraid to take chances, or re-invent himself within his art. This is quite an accomplishment when you look at his rise to fame. Reeves first became a household name when he took on a role as a sophomoric high school student, traveling through time in order to finish a history paper in Bill and Ted’s Excellent Adventure. This teen-age comedy is the type of film that often leads actors to become typecast in similar films. This was not enough for Reeves, he must have realized that this danger was present since he was next recognized for a performance in a small, more independent style film, working with actors considered more serious, without giving up his inane roles. In 1991, with the release of, not only the second in the Bill and Ted’s series, but also My Own Private Idaho and Point Break, Reeves showed his abilities in dramatic, comedic and action roles. These would pave the path toward a career filled with big budget action mega films like, Speed, The Matrix and 47 Ronin. Additionally, love stories like The Lake House and lower budget films like Generation Um.. Here is an actor who loves practicing his art and is not concerned with anything other than expanding his acting talent. There are few actors who have had this type of success, across so many varied genres. This would be enough to laud praises upon Reeves, but this is not the only part that should bring praise. Very few, if any actors, have Reeves penchant for generosity, leaving massive amounts of potential earnings to do what he wants, and being kind to the "regular" people he crosses. Unfazed by what critics or others may think, the way he lives his life shows his worth. He is possibly one of the most generous, conscientious Hollywood actor out there. When we think about issues that Hollywood actors may have, our thoughts often turn to self imposed issues, often related to alcohol, drugs or spousal infidelity. Reeves has never been reported caught in any of these situations. He has encountered difficulties in his life that appear to be less trivial. In fact, they seem to be situations that form an individual. They can either send someone into a personal tailspin, or allow someone to rise above the turmoil and find an inner strength that begins to define the person you are, and shine on others you touch. It could be mentioned that Reeves' upbringing was not a walk in the park. Reeves’s father was arrested for selling heroin when he was 12, his mother was a showgirl, subsequently marrying several times, and creating a family of stepsisters and an uncertain life for the young Reeves. Beyond that, his sister Kim has been battling leukemia for over 10 years, according to the UK Dailymail, his daughter was stillborn in 2000 and his partner, mother to the stillborn child, died in a tragic car accident in 2001. This is reality for Reeves and we could all agree that these issues would knock most people down. Although, it seems this life has not only spurned his drive toward movie star greatness, but has provided him with an outlook that is humble and generous. Helping others and spreading his wealth seems to be much more important than lining his own pockets. His ability to overcome these difficulties and become a huge success has been a blessing for all he touches. 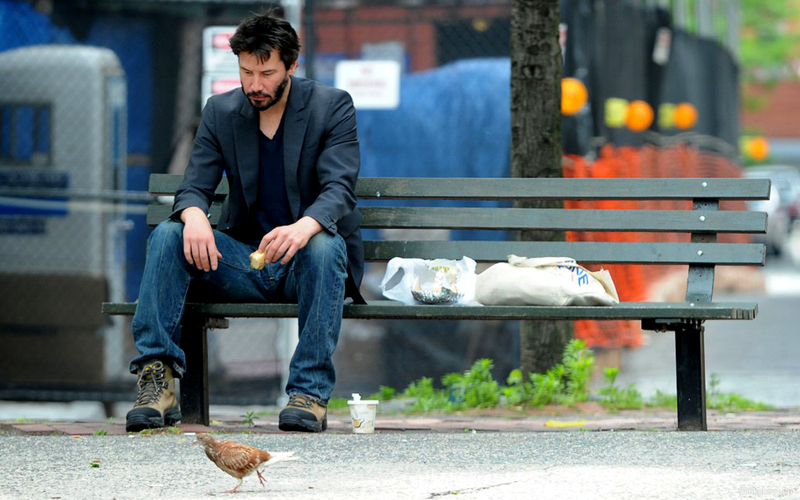 The easiest difference to notice with Keanu’s being, is his choice of lifestyle. Hollywood stars usually tend to move into lavish houses as soon as they make it big, this isn't the case for Reeves. He did finally buy a place in the Hollywood hills in 2003, but that was only after having lived in rented houses and hotels for his entire career. Long seen as the richest man without a home, when he did finally buy a place, it was rather modest for a man worth $350 million. Besides this house, he also has secondary apartments. Not the lavish penthouse style, 3 story homes, but regular flats without too many frills. Most stars have several mansions, in all corners if the world, but Reeves just keeps flats in New York and his hometown of Toronto, simple needs met with simple dwellings.. Although he loves motorcycles and owns a few, he often takes public transportation to get places. There are countless images of Reeves sitting among the commuters, reading the newspaper on the subway. He simply does not seem to give into the excess that his money could provide. Or course, this is all relative, as he does have much more than average people but on the whole, when compared to the other actors who have had success of his magnitude, he is rather erased. Never controversial, rarely seen in the tabloids, he has led a quiet celebrity life, which is actually a shame because his life should be celebrated as possibly one of the most generous actors in Hollywood today. In 2003 Reeves was quoted in Hello! magazine with saying: “Money is the last thing I think about..” This may sound like a marketing ploy. A quote used to endear the audience to the actor. Nothing can further be sourced from the truth for Reeves, he is one of those rare individuals who practices what he preaches. When cast in The Devil’s Advocate, Reeves took a several million dollar pay cut in order to get Al Pacino on board, he did the same for The Replacements where he took a 90% pay cut in order to get Gene Hackman on the cast. Additionally, he even refused an $11 million pay day for filming the sequel to Speed, and an opportunity to be in the film Heat with De Niro and Pacino, in order to play Hamlet. This was not for a world re-known theatre company, in which he was performing the play in a major city or in front of large audiences, but at the modest Manitoba Theatre Centre in Winnipeg, Canada. These were personal refusals of money, but he has done more than just refuse money, he has shared the wealth with those who are often forgotten in the movie process. The most telling tale of this thoughtful use of movie salary money was taking close to $75 million of his well negotiated ticket sales based salary, for The Matrix Reloaded and The Matrix Revolutions and gave it to the special effects and costume design teams. Citing that they were the true heroes of the movie franchise. This equated to over $1 million dollars per person, instantly making them all millionaires. He also gave every member of the stunt crew Harley Davidson motorcycles. Having your name attached to charities is a big deal in Hollywood. This is a perfect way to support a cause, while raising your profile. Reeves has spent millions of dollars supporting various causes which he supports. Whether it be PETA, SickKids Foundation, Stand up To Cancer or the numerous other charities he supports, the money is there and he does not look to get any attention or publicity through it. He has spent over $5 million dollars to help his sister in her fight against leukemia. It is also said by the Examiner that Reeves has a private cancer foundation to help a few children’s hospitals and cancer research, but he does not attach his name to it, preferring to provide funding and not take any credit for the work it does. Giving money to others is a part of his beliefs and way of life. If there was any doubt about Reeves' true sincerity on his charitable lifestyle, you can look to his actions with a homeless man, with whom he spent half a day sitting with in his squat, sharing food and just talking to him. There was no starstruck reverence, no condescension on Reeves part, just two humans talking about anything and everything, sitting on a sidewalk in LA. Whether it be giving away his money, riding the subway, supporting charities or spending time with regular people. Keanu Reeves is arguably more interesting than any of the characters he has portrayed through roles.